KHS’ vision is to be first choice in technology and service, a goal the company will once again be underlining at the K 2013 trade show for plastics and rubber. During the event in Düsseldorf, Germany, KHS Corpoplast and KHS Plasmax will be presenting innovative PET bottle design solutions in the field of PET expertise. The focus will be on the Bottles & Shapes program, a unique service and consultancy portfolio for the design and development of plastic bottles that KHS Corpoplast has been continuously perfecting for the last 35 years. Over the past ten years alone the company has created around 7,000 high-quality bottles using the Bottles & Shapes program, many of them lightweight, which have set new standards on the market. For instance, 0.5-liter PET bottles which weigh just 10.9 grams can currently be produced for carbonated water. 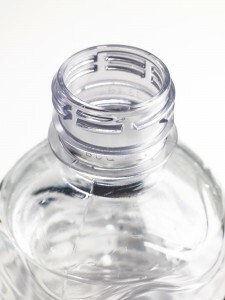 The present minimum weight for unpressurized 0.5-liter bottles for still water is a mere 8.7 grams. For the first time at K 2013 the company will be showing its newest innovation: a ‘streamlined’ bottle thread. The objectives behind this latest development were not just to reduce weight but also to ensure that the bottle can be transported by an air conveyor, the option can be retrofitted into existing lines and the performance of the stretch blow molder is maintained. In addition, the setup must be able to continue to use the caps applied in the past. All of these criteria have been met. To date, classic threads for carbonated beverages weighed 3.7 grams. The new development now permits an extra 1.1 grams of material to be saved in this area which at a line output of 48,000 bottles per hour results in a cost saving of approximately €385,000 per annum. KHS Corpoplast will be exhibiting its ‘lightweight’ thread at its trade show booth alongside many innovative bottles newly designed in the Bottles & Shapes program. At the time of writing the PET experts at KHS are working on reducing the thread weight of PET bottles for still beverages. One extremely important aspect of lightweight PET manufacture is that production has a high process stability. KHS Corpoplast stretch blow molders in the InnoPET Blomax Series IV are exemplary in this respect. The servomotor-controlled stretching process ensures that the stretching motion can be flexibly adapted to suit varying speeds in the filler area, for example. Other major advantages of the InnoPET Blomax Series IV are the high production capacity of up to 2,250 PET bottles per hour and blow station, optimized preform handling, much lower energy consumption thanks to the newly developed heater area and a reduction in the amount of compressed air used. New machine modules, such as the Feedflow preform infeed, permit safe handling of lightweight preforms at high speeds. One key topic is the saving in compressed air, with KHS Corpoplast again setting standards with its new Airback Plus development. This system allows about 40% of the compressed air consumed in the stretch blow molding process to be reused in the blow wheel. The previous statistic was just 10%. Other benefits of Airback Plus are that less energy and a smaller volume of high-pressure air are required for the stretch blow molding process than was previously the case. The compressor can therefore be smaller which cuts investment and running costs and reduces the maintenance effort. The Airback Plus option can also be retrofitted into InnoPET Blomax Series IV stretch blow molders and into those of the previous generation, the InnoPET Blomax Series III. Another point of great interest at K 2013 will be InnoPET Plasmax barrier technology for PET bottles now in use worldwide and the new Plasmax+ process. The chief advantage of covering the inside of PET bottles with a Plasmax coating is that maximum product protection is a given over a very long period for bottled beverages such as beer, juice and wine and liquid foods like ketchup and mayonnaise. A wafer-thin layer of SiOx (pure glass) ensures this protection, preventing the exchange of carbon dioxide, oxygen or flavorings, for instance, between the product and packaging as well as the environment. In particular beverages and liquid foods that have a very high pH are given further improved, long-term protection with the recently developed Plasmax+ process. Plasmax+ also has a better barrier effect where the bottle material is subject to very high mechanical stress from a high internal pressure. The new Plasmax+ technology can be integrated into most existing InnoPET Plasmax machines.